 Log In needed $419,000 · OPEN HOUSE SUNDAY MARCH 31 2-4pm. Immaculate top-floor west-facing corner unit. 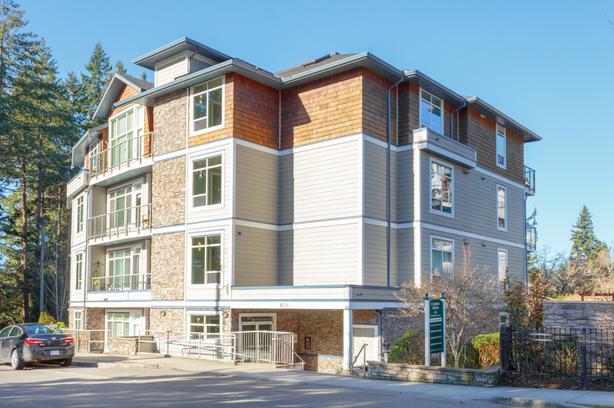 It doesn't get much better than this.. Well apportioned and inviting, this 2 bed 2 bath unit has 9ft ceilings and is bright with large windows and two skylights. Large kitchen with plenty of cupboards, granite counters, island. Bamboo floors. In-suite laundry. Master bedroom with closet organizer, ensuite with soaker tub & walk-in shower. Steps from Royal Colwood Golf course, down the road from Juan De Fuca rec centre, a few blocks from Langford City Centre. Canoe/Kayak & bike storage. Dogs and cats allowed, unrestricted rentals, no age restrictions, BBQs allowed on the large balcony. Depreciation report available. Chattels negotiable. Quick possession possible. 402-608 Fairway Avenue. Open Sunday March 31 2-4pm.